On 8 September, 1888, in the article "Some Possible Forms of Phonograph" of the British magazine Electrical World, some Oberlin Smith published one of the earliest works dealing with magnetic recording, and suggested (probably for the first time) the use of permanent magnetic impressions for the recording of sound. Oberlin Smith (1840-1926) was an engineer and owner of a machine shop from Bridgeton, New Jersey, USA. 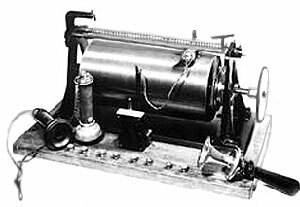 In 1877 Smith learns about the invention of magnetic sound recording device (phonograph) by T. A. Edison and decided to improve the Edison phonograph, without initially getting away from magnetic sound recording. In 1878 he invented his Electric Phonograph or Recording Telephone and draws up a "Caveat" (temporary patent) for the US Patent Office to a certain extent as a preliminary stage for a patent application on an Electric Phonograph or Recording Telephone, which deals exclusively with magnetic sound recording. Smith had fabricated a cotton or silk thread (see the nearby drawing from the 1878 "Caveat"), into which steel dust or short clippings of fine wire would be suspended. These particles were to be magnetized in accordance with the alternating current from a microphone source. Smith also discussed the possibility of using a hard steel wire, but thought it scarcely possible. A working unit was never built. The Smith's ideas were further developed by the Danish engineer Valdemar Poulsen (1869–1942). In 1898 in his Telegraphone (see the nearby photo) he implemented for the first time the magnetic wire, and it was the first practical apparatus for magnetic sound recording and reproduction. In the same 1898 Poulsen obtained patent in Denmark for his device, and later in other countries, see US patent 661619). Magnetic wire recording, and its successor, magnetic tape recording, involve the use of a magnetizable medium which moves past a recording head. An electrical signal, which is analogous to the sound that is to be recorded, is fed to the recording head, inducing a pattern of magnetization similar to the signal. A playback head (which may be the same as the recording head) can then pick up the changes in the magnetic field from the tape and convert them into an electrical signal. Poulsen with his assistant, Pedersen, later developed other magnetic recorders that recorded on steel wire, tape, or disks. None of these devices had electronic amplification, but the recorded signal was easily strong enough to be heard through a headset or even transmitted on telephone wires. On the 1900 World Exposition in Paris, Poulsen had the chance to record the voice of Emperor Franz Josef of Austria which happens to be the oldest surviving magnetic audio recording today. First magnetic drum memory, a magnetic data storage device and an early form of computer memory widely used in the 1950s and into the 1960s, was invented by the Austrian engineer Gustav Tauschek (1899-1945) in 1932 in Austria. Tauschek was a genius self-taught Viennese engineer, who besides the drum-memory, invented also many devices and systems for the punch-card machinery, as well as the first OCR (Optical Character Recognition) machine in 1928 (see the US patent 2026329), so called reading machine. What a pity, that he had to work in this terrible wartime and died so young. Tauschek used to work for IBM and sold 169 patents to IBM in his life-time. In the same 1932 Tauschek obtained US patent for his device (see US patent 1880523 and the lower patent drawing). In its most basic form, magnetic drum memory is simply a metal drum or cylinder coated with a ferromagnetic material. Stationary write heads emit an electrical pulse, changing the magnetic orientation of a particle at a given position on the drum. The read heads, which are also stationary, recognize a particle’s orientation as either a binary 1 or 0. Tauschek’s prototype could store 500000 bits across the drum’s total surface for a capacity of about 62.5 KB. The principles at work in magnetic drum memory helped to lead researchers to create another and even more important innovation: the hard disk drive. 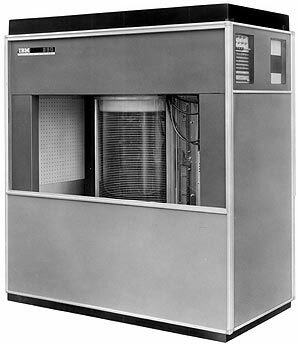 In September 1956 IBM introduced a new model computer—IBM 305 RAMAC (Random Access Memory Accounting) system. Nothing interesting as a design, it was one of the last vacuum tube systems designed in IBM, but... it introduced disk storage technology to the world—IBM 350 Disk Storage (see the nearby photo), so it became a market hit and more than 1000 305s were built before production ended in 1961. The 350 Disk Storage Unit consisted of the magnetic disk memory unit with its access mechanism, the electronic and pneumatic controls for the access mechanism, and a small air compressor. Assembled with covers, it was 150 cm long, 170 cm high and 72 cm deep. It was configured with 50 24-inch magnetic disks containing 50000 sectors, each of which held 100 alphanumeric characters, for a total capacity of 5 million characters. Disks rotated at 1200 rpm, tracks (20 to the inch) were recorded at up to 100 bits per inch. The execution of a "seek" instruction positioned a read-write head to the track that contained the desired sector and selected the sector for a later read or write operation. Seek time averaged about 600 milliseconds. The disk system cost some $10000. Over the next several years, as storage memory continued to evolve, the HDD would emerge as the next new, more adaptable solution and would replace many of the earlier, groundbreaking storage technologies. During the first several decades of the development of HDDs, IBM was the main innovator. In 1961 it invented heads for disk drives that "fly" on a cushion of air or on "air bearings." In 1963 it came up with the first removable hard drive, the 1311, which has six 14-inch platters and holds 2.6MB. In 1966 it introduced the first drive using a wound-coil ferrite recording head. In 1973, IBM introduced the 3340 or Winchester Direct Access Storage Facility (see the upper photo). The smaller and lighter 3340 marked the next real evolutionary step in hard disk storage. The 3340 featured a smaller, lighter read/write head that could ride closer to the disk surface—on an air film 18-millionths of an inch thick, and with a load of less than 20 grams. The Winchester disk file’s low-cost head slider structure made it feasible to use two heads per surface, cutting the stroke length in half. 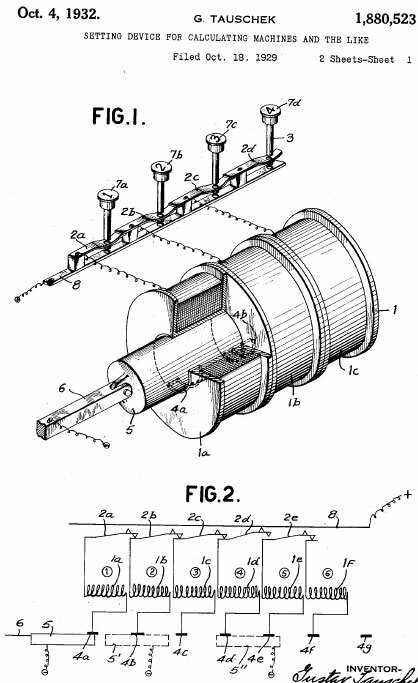 The disks, the disk spindle and bearings, the carriage, and the head-arm assemblies were incorporated into a removable, sealed cartridge. A track density of 300 tracks per inch and an access time of 25 milliseconds were achieved. It had three types of data modules: 35 megabytes, 70 megabytes, and 70 megabytes of which 0.5 megabyte were accessible with fixed heads. 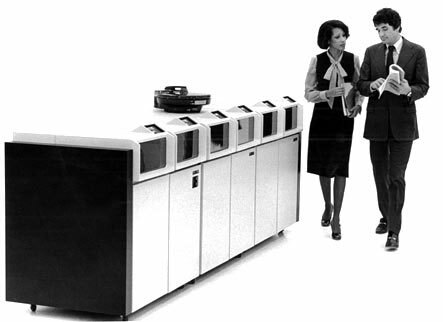 Two-to-four 3340 drives could be attached to the IBM System/370 Model 115 processor, which had been announced concurrently with the 3340, thus providing a storage capacity of up to 280 million bytes. IBM continued also to decrease the size of the disks and the platters. In 1979 IBM's 3370 uses seven 14-inch platters to store 571MB, the first drive to use thin-film heads. The same 1979 was introduced IBM's "Piccolo," which uses six 8-inch platters to store 64MB. In 1980, a new and unknown company made a small revolution in HDD (hard disk drives) production. Till then only large and well funded companies could afford to buy a hard disk, but now it became possible for broader public. Seagate Technology was founded in 1979 (under the name "Shugart Technology") by Alan Shugart and Finis Conner. Their first product (released in 1980) was the ST-506 (see the nearby photo), the first hard disc to fit the 5.25-inch form factor of the (by then famous) Shugart "mini-floppy" drive. The ST506 held just 5MB of data and cost $1500. The hard disc was a hit, and was later released in a 10-megabyte version, the ST-412. 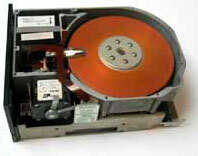 In 1983 the company Rodime releases the first in the world 3.5-inch hard drive. The company engineers used again 3.5-inch form factor of the floppy disk drives. The RO352 includes two platters and stores 10MB. 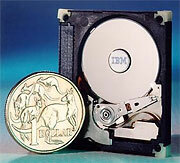 In 1998 IBM announced its Microdrive (see the nearby photo), the smallest hard drive to date, designed to fit in a CompactFlash (CF) Type II slot. It was launched in 2 models—170 MB and 340 MB. The hard disk uses round, flat disks called platters, coated on with a magnetic medium, designed to store information as magnetic patterns. The platters are stacked and mounted onto a spindle. Driven by a special motor connected to the spindle the platters rotate at very high speed (up to 15000 RPM-revolutions per minute). Electromagnetic read/write heads are used to either write onto or read information from a disk platter. The read/write head are mounted on an arm, who's position is controlled by an actuator. A logic board controls the drives activities and communicates with the connected computer system. In 2007 it is estimated that over 90% of all new information produced in the world is being stored on magnetic media, most of it on hard disk drives. From 5 MB (1 MB = 1 million or sometimes 1048576 bytes) the capacity of the first IBM hard disk, now the capacity of a single HDD reached several TB (1 TB = 1000 billion bytes), a growing of some 1000000 times. From 24 inch platters of the first HDD, now you can buy a HDD with 0.8 inch platters. Value for money has also increased dramatically, from $2000 for Megabyte for the first HDD, to the $0.0004 for Megabyte in 2007. However, in spite of new technologies like perpendicularly aligned bits and HAMR, hard disks are mechanical devices at heart and, as such, they face many performance challenges. Mechanical devices cannot improve as quickly as solid state technologies can. For example, over the past 20 years, microprocessor technology, which plays a key role in data storage efficiency and function, has enabled CPU performance to nearly double every 18 months. Put another way, CPU performance has increased 16800 times between 1988 and 2008, but HDD performance has increased by just 11 times. To try to close the HDD performance gap, manufacturers have increased the drive’s rotational speed, added more advanced heads, and used techniques like short stroking, which restricts data to 5%–30% of the platter to boost performance. Western Digital, for example, recently released a speedy 20000 RPM HDD. But faster and faster disk rotation cannot be a lasting answer because these high-speed disks potentially make more noise, devour more power, and become increasingly less reliable. In addition, these higher-performance disks all sacrifice capacity. Each time the CPU issues a command, the hard drive’s mechanical system must then seek the requested data block or file by rotating its spinning platter and reaching out with its actuator. So, indications are that, ultimately, as storage systems continue to evolve, hard disks will be replaced.